Any Way You Slice It, Wisconsin Dominated The U.S. Cheese Championships : The Two-Way The first, second and third-place cheeses all hailed from America's Dairyland. 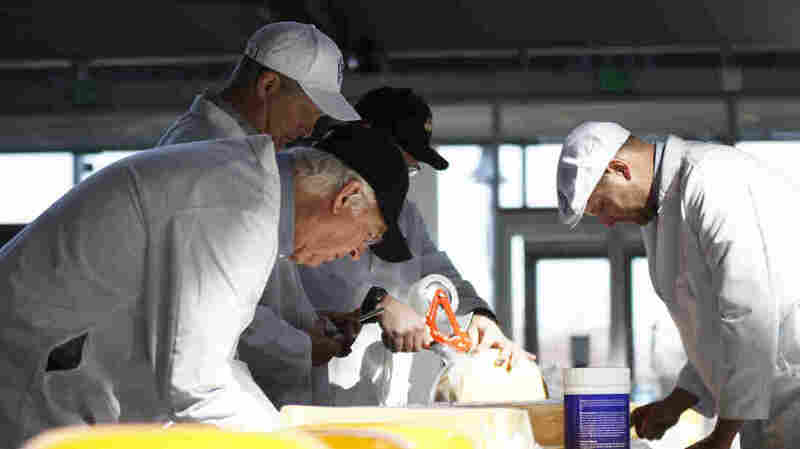 On Tuesday, William Wangerin (front) and three other judges consider cheeses at the U.S. Championship Cheese Contest in Green Bay, Wis. The contest organizer, Wisconsin Cheese Makers Association, says the number of cheeses, yogurts and butters competing at this year's event is at an all-time high. America's Dairyland took home the first, second and third-place prizes at the U.S. Championship Cheese Contest this week — with a black-pepper-flavored hard cheese from Antigo, Wisc., at the top. Second place went to an aged cheddar from Weyauwega, and third place to a gouda from Thorp. A record 2,303 dairy products — included butter, yogurt and cheese — were submitted to the contest, according to the organizers. Daniel Higgins of the Green Bay Press-Gazette reported from the awards ceremony on Thursday. He said that winning cheesemaker Mike Matucheski thanked "those wonderful cows" in his victory speech. The U.S. Championship Cheese Contest started in 1957 and is held every other year — alternating with the World Championship Cheese Contest. Both events are hosted in Wisconsin, and run by the Wisconsin Cheese Makers Association, but the state doesn't always dominate so thoroughly. In the 2015 U.S. championship, a Swiss wheel from Ohio came in first; in 2013, a Wisconsin cheese was the top winner, but Vermont and Illinois were also represented in the top three. And while a Wisconsin cheesemaker won the 2016 world championship, it was the first U.S. victory since 1988. In the decades between, Austria, Denmark, the Netherlands, Australia and Switzerland were the conquering countries.